Poroshenko spoke in the interview program titled "A year of Poroshenko", dedicated to the anniversary of him being elected president after the previous leader was toppled in a coup. Ukrainian TV aired the program on Thursday night. 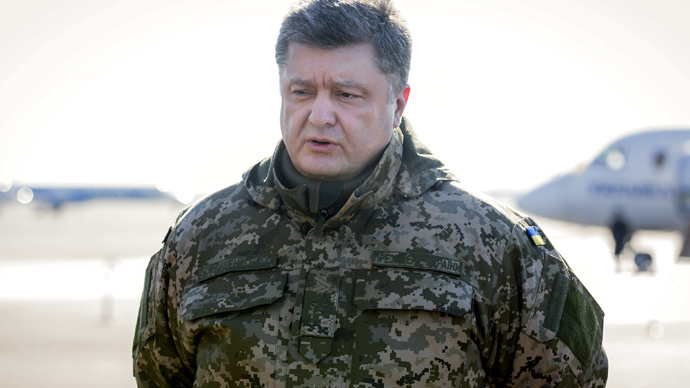 He said he would sign a decree introducing martial law immediately, should there be an offensive against Kiev's army in the east of the country: "My key position: if the ceasefire is broken now, if the line of confrontation is crossed, if an advance against the Ukrainian armed forces is organized, at that very moment I will sign the decree on introducing martial law and pass it to parliament. "I have no doubt that within hours, martial law will be enacted," Poroshenko continued, saying that it will allow Ukraine to "demonstrate its readiness for war, for victory, for defense and for peace." The Ukrainian president claims that during his term the martial law protocol was significantly "improved." The latest edition does include a number of new features. One of those is the extrajudicial detention and forced relocation of citizens of a "foreign country that threatens or undertakes aggression towards Ukraine." This might be any Russian since Russia is considered an "aggressor state" at an official level. Kiev believes it to be supporting anti-government fighters in eastern Ukraine, which Moscow vehemently denies. Apart from the forced relocation of foreigners, martial law allows the authorities to confiscate private property, take full control of any media and ban any political parties and organizations that are deemed a threat. It will also be able to prohibit any and all rallies and mass gatherings. For martial law to be enacted, the parliament has to approve a corresponding ruling by the Ukrainian president. It can be declared in the whole country or selected regions. Poroshenko also stressed that foreign countries would not be able to send military aid to Ukraine should there be a full-scale war. "I have never heard that, you know, 'we would help you, but you don't really have a war," he said. "Quite the opposite: 'unfortunately, if there is war, international law prohibits us from giving you the aid that we can give you now." The death toll in the Ukraine conflict has exceeded 6,000 people. Over 15,000 have been injured, according to UN estimates.